Adrian Lee was born and raised in London, England. He studied History and History methodologies for his Masters degree and lectured for 14 years - becoming the Head of several Art and History Departments and a Local Government Advisor for education. 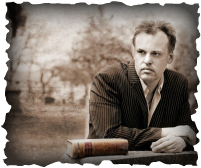 Adrian is the founder of the International Paranormal Society and a member of the Luton Paranormal Society in England; he has investigated ghosts and haunted buildings throughout Britain and America - particularly the Midwest area. L J is a native of MN and a farm girl with a lifelong interest in science and nature. Her education focused heavily on the sciences, but when she joined MUFON (Mutual UFO Network) and began to seriously delve into the mysteries of UFOlogy she added the science of the mind to her curriculum and is currently pursuing a degree in psychology. Working as a UFO investigator, and being an objective skeptic, led her to take a course in criminal investigation and evidence prep, which in turn led to a job as a death investigator, and eventually to becoming a member of TIPS. Karen has lived in Central MN all her life. She is well grounded in nature as an avid rock hound, yet her scientific soul has been influenced by Carl Sagan, Dr. Who, The X-Files, The Day the Earth Stood Still, The Thing, and The Blob. (For years she couldn’t go to sleep without checking under the bed!) Karen always needed answers to “why?” but rarely got them. One of her favorite classes in high school was World Religions, which really opened her eyes to how other cultures and beliefs can be so similar yet so different at the same time. Paul was one of “those types” from the beginning – one who questions everything and asks the odd questions about things most people don’t like to talk about. He is a geek and nerd only in his fascination with science and “the old sciences.” So getting involved in UFOs and ghost hunting was as natural as working in electronics and computers. He enjoys working with groups who don’t go pale or drop their jaws when you mention anything paranormal! ​Katrina (Katey) grew up in England, in sight of the Welsh Hills, and it was here as a child, she started her psychic journey. After moving to Minnesota, she set aside her gifts for several years, but reawakened them after raising her daughters. Katrina first met Adrian and Heather while working at a Psychic Fair in Mankato. She joined the TIPS team with some skepticism of the electronic tools used; however, she now embraces them as both an additional and an alternative communication bridge to the spirit world. " I do enjoy that working with TIPS allows me to investigate places not generally accessible at night when there is far less pollution from daily activity. I enjoy the heightened focus this allows as well as the group sharing of these experiences." Heather was driven into the paranormal world at a very young age. This came from an encounter in her Grandmother’s home when Heather was only 8 years old. Since that first experience she has been determined to find answers through research and investigation. In 2008 Heather started a paranormal group with her sister Ashley. Both are determined to help others and seek out answers to their own questions. Heather brings a very critical eye to “spirit photography” and enjoys listening for “EVPs” on digital voice recorders (her favorite piece of equipment). She is diligent to study, research, debunk, and look for every possible explanation before presenting possible evidence. Ashley joined her sister in a paranormal group in hopes of finding answers to their own questions. She brings a methodical scientific approach to the phenomenon and scrutinizes all the evidence with a critical eye. As a nurse, and student of pscychology, Ashly is very compassionate and the spirits seem to sense that, and interact willingy with her. Brian lives in S.E. Minnesota, but was raised in southern California before moving to Minnesota. His grandfather and mother had psychic abilities, which were passed on to Brian. His paranormal experiences began when he was very young. Brian always managed to ignore these experiences, until recently, and is now learning to embrace it. "Being a member of TIPS gives me the opportunity to develop my abilities as well as attempting to answer my many questions." Patt lives in S.E. Minnesota now, but was born and raised on a farm in central Minnesota. Having had little experience with the paranormal, on a whim she attended a public event hosted by TIPS, and found it to be an amazing experience. Sometime later she had the opportunity to become a member of the TIPS team. ​"I have a strong interest in history, and utilize that knowledge in our investigations." Gloria is a southern MN girl who became fascinated with the paranormal at an early age. Most of the places on her bucket list are tied to hauntings. Any trip, whether it be vacation or work, requires a bookstore purchase of the local ghost stories. Gloria loves the outdoors and currently resides in North Dakota. Scott was born and raised in Duluth, where his first paranormal experiences were in high school and college. Although his curiosity was piqued, there wasn't much formal parapsychology training available at UMD! A few decades later his interest was renewed when he bought an "active" house. Soon after, Scott attended one of Adrian's events in Walker, Mn, and was hooked. Now, several years later, he has investigated homes, businesses, empty fields, and just about anywhere he can get into. Scott brings a very strong science background to our investigations, and a skeptic's eye.